Do not store corrosive hazardous materials inside the gas cylinder storage unit. Corrosive items are volatile and incompatible storage may pose a hazardous situation. Gas pressure regulators shall be used – make sure gas pressure regulators are inspected before use. Gas detectors and oxygen sensors may be used depending on different operational storage techniques. Keep toxic gas cylinders stored separately in a well-ventilated storage facility, with a dry fire suppression system. All gas cylinders must be stored with a caps or valves for complete compliance. Gas cylinder storage containers must contain extra space for personnel and carts to allow for inventory deliveries, loading, offloading and transportation. Gas cylinders must be separated by two distinct groups: “FULL” or “EMPTY” groups classified accordingly. All gas cylinders must comply with all NFPA, and DOT labeling requirements and OSHA hazard requirements. 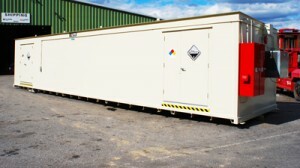 Gas Cylinder Storage buildings by US Chemical Storage. Customizability with racking systems, fire suppression systems and more. Gas Cylinder Storage by US Chemical Storage exceeds all EPA, OSHA and NFPA regulations, while meeting all FM Approvals and Warnock Hersey standards. Custom fit your gas cylinder storage container with our full line of parts and accessories to deliver a safe and secure work environment. Our gas cylinder storage containers are perfect for welding operations as well as other cutting and brazing operations. All gas cylinder containers are 100% compliant and built in the USA from heavy gauge steel for superior strength and reliability. Designed by our professional engineers, our gas cylinder units are tested before they leave the factory for complete quality assurance. At US Chemical Storage, we offer the safest, most reliable, high quality chemical storage buildings to make your gas cylinder storage fully compliant. Call or contact one of our sales engineers to find out how to make your gas cylinder storage 100% compliant.